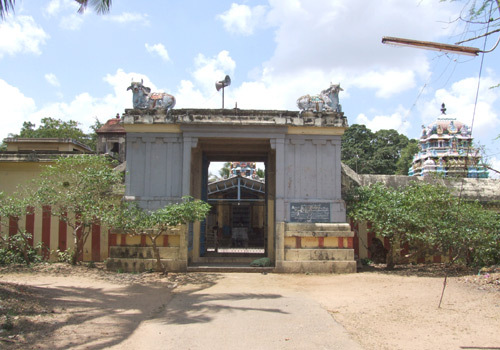 The Lord of the temple is praised in the hymns of Saint Tirugnana Sambandar.This is the 110th Shiva temple on the southern bank of Cauvery praised in hymns. Guru Puja of Arivaldaya Nayanar is celebrated on the Arudra star day in the month of Thai-January-February. 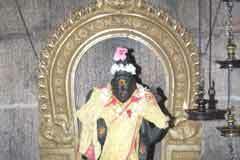 Lord in the temple is a swayambumurthi. 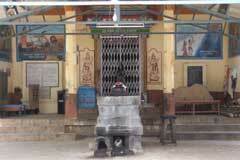 This is the birth place of Saint Arivaldaya Nayanar, one of the 63 Saivite Nayanmars. The temple is open from 6.30 a.m. to 12.00 a.m. and from 4.30 p.m. to 8.30 p.m.
Sri Neeneri Nathar Temple, Thandalaicherry, Velur – 614 715. Tiruthuraipoondi taluk, Tiruvarur district. Farmers pray here before commencing cultivation. Those suffering from leprosy pray to Lord for a cure after a bath in the sacred spring. Farmers contribute their yields to the temple. It is the staunch faith of those suffering from leprosy that their cure is a certainty if they pray in this temple. 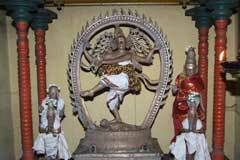 It is noteworthy that Mother Ganga, traditionally on the head of Lord Nataraja is at His feet in this temple. 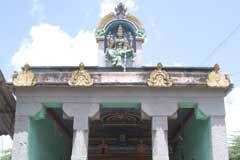 Chola king Kochengannan built a number of Mada temples for Lord Shiva. He was infected with leprosy once. 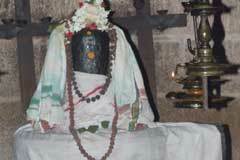 He visited temples after temples praying to Lord Shiva for cure but in vain. Lord Shiva advised the king in a voice to go to a place where a stone bull will eat grass. 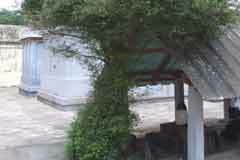 When he came to this temple with a garland of grass for Lord, the Nandhi (Stone Bull) pulled the garland and ate it. King recalled the advice of Lord Shiva. His disease disappeared. King did many renovations to the temple. There was a village named Kannamangalam 2 km north of Thandalacherry. This place is now called Kannandangudi, praised as the prosperity capital of the Chola kingdom. This also has the honour of the birth place of Thayanar of Velalar-farmers community. He was very kind to all Shiva devotees. It was his mission to offer Samba rice (a rich variety of rice) with Palak-Keerai in Tamil and mango pickles as nivedhana to Lord every day. Though he had contributed for many renovations in the temple, in his opinion this nivedhana occupied all priority. His wife also joined Nayanar in the worship. Poverty entered his life. That could not dishearten him. An employer once, he became a farm employee himself and used the wage for the nivedhana service of Lord. As the wage rice went to the Lord, he and his wife had only the palak-keerai in Tamil for their food. That also fell short. They lived on mere water but were glad that they earned the rice for the Lord. Once, when Nayanar was carrying the nivedhana to Lord, as they were exhausted due starvation, his wife fell down and when Nayaran rescued her, the basket of nivedhana fell and scattered. 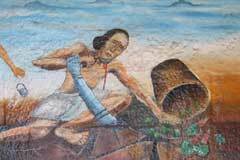 As it went waste, Nayanar took the small sickle he had for cutting paddy and was about to kill himself. Shocked by the magnitude of Nayanar’s devotion, his wife held her Mangal Sutra in her hands and cried to Lord to save her from widowhood. A hand with Rudraksha appeared from the ground where the Nivedhana fell scattered and held Nayana’s hand and prevented his attempt to kill himself. 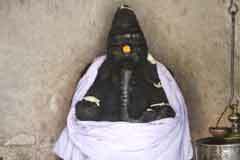 He granted darshan with Mother Parvathi to Nayanar and his wife. As Nayanar ventured to use the sickle – Aruval in Tamil, he came to be known as Arival Thaya Nayanar. 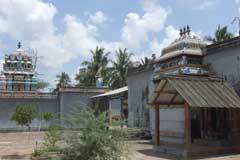 Thandalacherry, 17 km from Tiruvarur can be reached by buses bound to Tiruthuraipoondi.